. He should have kept Allende from getting in." to do all possible short of a Dominican Republic-type action to keep Allende from taking power." Other declassified records show that Nixon secretly ordered maximum CIA covert operations to "prevent Allende from coming to power or unseat him" in the fall of 1970 but that Ambassador Korry was deliberately not informed of covert efforts to instigate a military coup. When the White House-ordered covert operations failed to prevent Allende's November 3, 1970, inauguration, Nixon's national security advisor, Henry Kissinger, lobbied vigorously for a hard-line U.S. policy "to prevent [Allende] from consolidating himself now when we know he is weaker than he will ever be and when he obviously fears our pressure and hostility," according to a previously unknown eight-page briefing paper prepared for the President on November 5, 1970. In the secret/sensitive "memorandum for the president" Kissinger claimed that Allende's election posed "one of the most serious challenges ever faced in the hemisphere" and that Nixon's "decision as to what to do about it may be the most historic and difficult foreign affairs decision you will have to make this year." The memorandum reveals that Kissinger forcefully pressed the President to overrule the State Department's position that there was little Washington could do to oppose the legitimately elected president of Chile and that the risks for U.S. interests of intervening to oppose him were greater than coexisting with him. "If all concerned do not understand that you want Allende opposed as strongly as we can, the result will be a steady drift toward the modus vivendi approach," Kissinger informed Nixon. Kissinger personally requested an hour to brief Nixon on November 5 in preparation for a National Security Council meeting to discuss Chile strategy the next day. The briefing paper records his threat perception of an Allende government as a model for other countries. As Kissinger informed the president: "The example of a successful elected Marxist government in Chile would surely have an impact on-an even precedent value for-other parts of the world, especially in Italy; the imitative spread of similar phenomena elsewhere would in turn significantly affect the world balance and our own position in it." According to a transcript of the NSC meeting published in The Pinochet File, Nixon told his aides the next day that "our main concern is the prospect that [Allende] can consolidate himself and the picture projected to the world will be his success." "This document is the Rosetta stone for deciphering the motivations of Kissinger and Nixon in undermining Chilean democracy," according to Peter Kornbluh who directs the Archive's Chile Documentation Project. "It reinforces the judgement of history on Kissinger's role as the primary advocate of overthrowing the Allende government." The Archive also posted today a series of declassified transcripts of Kissinger's staff meetings after he became Secretary of State. 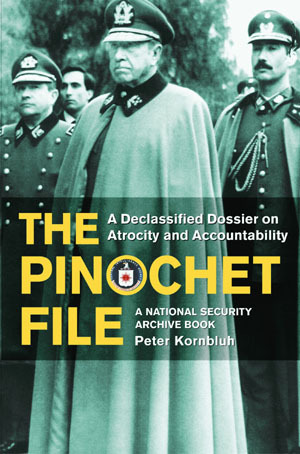 The transcripts, dated from the days following the coup that brought General Augusto Pinochet to power through the first several years of his regime's repression in Chile, record Kissinger's attitude toward human rights atrocities and mounting Congressional pressure to curtail U.S. economic and military assistance the military regime. They are quoted at length in Kornbluh's book, The Pinochet File, and recently cited in the New York Times Week in Review section (December 28, 2003). According to the first transcript dated October 1, 1973, when Kissinger was informed by his assistant secretary of inter-American affairs of initial reports of massacres following the coup he told his staff that the U.S. should not defend what the regime was doing. However, he emphasized: "But I think we should understand our policy--that however unpleasant they act, the [military] government is better for us than Allende was." As pressure from human rights advocates mounted for Washington to distance itself from the Pinochet regime, according to the transcripts, Kissinger argued that the Chilean military government was no worse than other Latin American nations and repeatedly voiced concern that the junta would collapse without U.S. support. "I think the consequences could be very serious, if we cut them off from military aid," Kissinger told his staff during a December 3, 1974, meeting. Well, I read the briefing paper for this meeting and it was nothing but Human Rights. The State Department is made up of people who have a vocation for the ministry. Because there were no enough churches for them, they went into the Department of State. In this White House tape, President Nixon is recorded on March 23, 1972, speaking by phone to his White House press secretary, Ron Zeigler about damage control efforts on the first major covert operations scandal of the 1970s-the ITT papers on Chile. Zeigler reports on a State Department press conference held earlier in the afternoon. He tells the president that the key issue was an ITT memo that stated that in the fall of 1970, U.S. Ambassador Edward Korry had received a "green light" from the White House to "do everything short of a Dominican Republic-type action" to stop Allende. Nixon demands to know how that leaked out, and then emphatically states that Korry "was instructed" to do that. The President then scapegoats the Ambassador for failing to carry out those instructions. Numerous declassified records make it clear that Nixon and Kissinger explicitly ordered the CIA not to inform Ambassador Korry of their efforts to instigate a military coup to keep Allende from assuming office. .If all concerned do not understand that you want Allende opposed as strongly as we can, the result will be a steady drift toward the modus vivendi approach." 3) Department of State, SECRET/NODIS, "Secretary's Staff Meeting, October 1, 1973"
At the first staff meeting following Henry Kissinger's confirmation as Secretary of State, Chile is a key topic. In this transcript, Assistant Secretary for Latin America, Jack Kubisch, comes to the meeting from Capitol Hill and reports that legislators are peppering him with questions about massive atrocities by the new military regime in Chile. He tells Kissinger that Newsweek magazine has reported 2700 bodies piled up in the central morgue in Santiago. "I've been asked: 'How many people have been killed? Is it true, the rumors we hear,'" Kubisch states. Kissinger responds by making his policy toward the new Pinochet regime clear. He tells his staff: "I agree that we should not knock down stories that later prove to be true, nor should we be in the position of defending what they're doing in Santiago. But I think we should understand our policy-that however unpleasant they act, the government is better for us than Allende was." 4) Department of State, SECRET/NODIS, "Secretary's Staff Meeting, October 2, 1973"
In staff meeting the next day, Assistant Secretary Jack Kubisch asks Secretary Kissinger if Pinochet's new foreign minister should be invited to an upcoming diplomatic luncheon in New York City with other Latin American ministers. "Your behavior with him will be watched very close by the others to see whether or not you are blessing the new regime in Chile, or whether it is just protocol," Kubisch advises Kissinger. "What will be the test? How will they judge?," Kissinger asks. "I suppose if you give him warm abrazzos, sitting next to you, and huddling in the corner, that will all be reported back to their governments. [Laughter. ]," Kubisch responds. At this staff meeting, Secretary Kissinger spends considerable time discussing Congressional efforts, led by Senator Edward Kennedy, to restrict U.S. military assistance to the Pinochet regime. The transcript records Kissinger's vehement opposition to such legislative initiatives, on the grounds that they are unfair to the Chilean military government, could lead to its collapse, and set a dangerous precedent for cutting assistance to other unsavory governments the Ford Administration is supporting. "Well, am I wrong that this sort of thing is likely to finish off that government?" he demands to know. Later he asks: "Is this government worse than the Allende government? Is human rights more severely threatened by this government than Allende?" According to Kissinger, "the worse crime of this government is that it is pro-American." In response, Assistant Secretary for Latin America, William Rogers informs the Secretary, "in terms of freedom of association, Allende didn't close down the opposition party. In terms of freedom of the press, Allende didn't close down all the newspapers." At this staff meeting, the discussion of the State Department's response to Senator Kennedy's efforts to curtail assistance continues. Kissinger tells his staff that he won't tolerate concessions to Congress on human rights and again expresses concern that the Pinochet regime will collapse. "We can't acquiesce on that, and I have to talk to the President," he states. "We cannot get into that business while I'm here, of behaving that way, of making a deal with a Senator that we know is against the national interest. You know the only possible outcome of this can be an extreme left wing government in Chile or driving the Chilean Government sort of toward the Arabs."
." He continues: "It is a problem of the whole foreign policy that is being pulled apart, pulling out thread by thread, under one pretext or another." This transcript records a meeting between Secretary Kissinger and Pinochet's foreign minister, Patricio Carvajal, following Chile's decision to cancel a visit by the United Nations Human Rights Commission investigating human rights crimes. Kissinger begins the meeting by disparaging his staff "who have a vocation for the ministry" for focusing on human rights in the briefing papers prepared for the meeting. He tells Carvajal that condemnation of the Pinochet regime's human rights record is "a total injustice," but that "somewhat visible" efforts by the regime to alleviate the situation would be useful in changing Congressional attitudes. "Our point of view is if you do something, let us know so we can use it with Congress." Kissinger, Carvajal, and Assistant Secretary Rogers then discuss U.S. efforts to expedite Ex-Im Bank credits and multilateral loans to Chile as well as cash sales of military equipment. At the end of the meeting, Kissinger voices support for the regime's idea to host the June 1976 OAS meeting in Santiago as a way of increasing Pinochet's prestige and improving Chile's negative image.